You can build self-contained agents that will run without the need for the Content Grabber application to be present on the target computer. 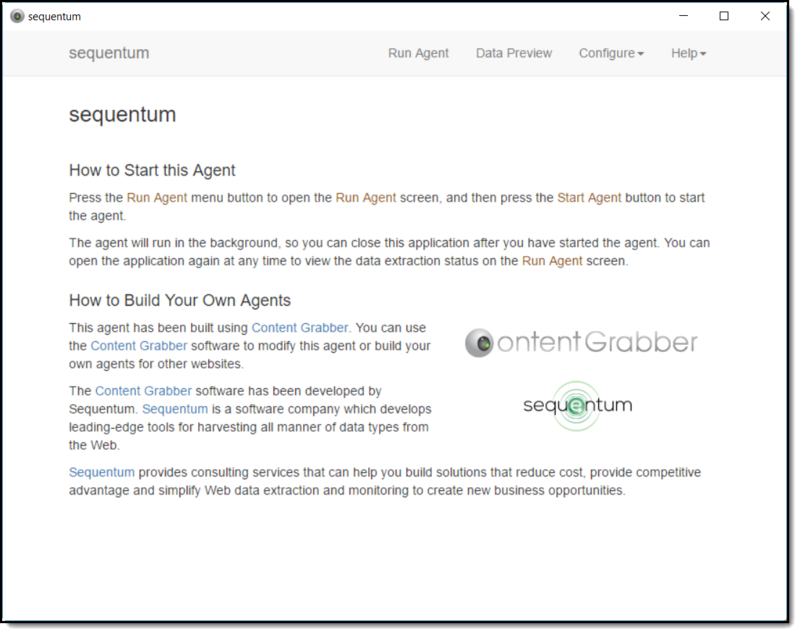 Self-contained agents can be distributed royalty-free, and includes a user interface that allows end users to configure and run the agent. Note: the self-contained user interface has an introduction screen that contains a promotional message for Content Grabber and Sequentum. This message can only be removed if you are using a premium version of Content Grabber. A self-contained agent can only export to file formats (Excel, CSV or XML). It cannot export to databases or execute a data export script. Self-contained agents require .NET v4.5+. The self-contained agents will not attempt to download and install the required .NET version if it doesn't exist on the target computer, but most Windows computers will already have this version of .NET installed. 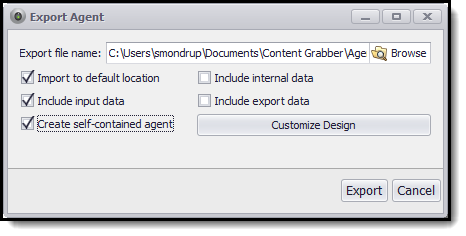 1.Click the Export Agent application menu to open the Export Agent screen. 2.Make sure you check the option Create self-contained agent. 3.You can now click Export to create the self-contained agent. Before creating the self-contained agent you can click Customize Design to customize the design and text displayed on the agent's user interface. For more information, see the topic Customizing the User Interface. All files required to configure and run a self-contained agent are included in a single executable file which can be distributed royalty free. Any custom assemblies used by an agent are included in the executable file, but only if they are located in the Assemblies folder for the agent. Assemblies shared by agents and located in the shared Assemblies folder are not included in the executable file, and should not be used in self-contained agents. You can upgrade an agent if the target website of a self-contained agent has changed and you need to make changes to the agent in order for it to work correctly. Simply make the changes to your agent and export the agent again. The end-user can override his existing self-contained agent with your new agent. Any configuration changes the end-user has made to the agent will not be lost. For more information, see the topic Using a Self-Contained Agent.